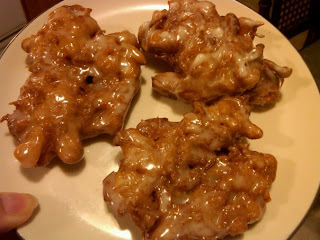 I got frustrated when I looked online and couldn't find an apple fritter recipe to match those you find in a donut shop. So I went on a baking mission today to get it right. According to my critics (my neighbors, roommate, and boyfriend) these are the real deal. NOTE: As with most of my recipes, this makes a lot. I ended up with about 2 dozen fritters, give or take. If you make them "donut shop size", then you will probably end up with about a dozen or so. Double glaze recipe if dipping both sides (which I did). Peel and core apples. Chop into pieces, about 1/4 to 1/3 inch is good, it doesn't have to be exact. Chunks are ok! Set aside. In a separate bowl, mix milk and eggs lightly. Mix with dry ingredients until combined. Fold in apples. Make glaze by mixing all ingredients together in a bowl slightly larger than the fritters you will be making, set aside. I used about 2 inches of oil to fry the fritters in. It's hard to say how long exactly you need to fry on each side as it depends on how big you make your fritters. When they're golden brown, flip them. When that side is golden brown, use a slotted spoon to remove them from the oil. Place freshly removed fritters on paper towels to absorb some oil. Place a paper towel on the top of the fritter(s) as well. After a minute or two, dip one or both sides into the glaze using a fork. Let excess glaze run off of the fritter, and place on a cooling rack with aluminum foil or paper towels underneath. You can improvise this, they will just have a little more glaze. Keep going until all the dough is used up, and enjoy!